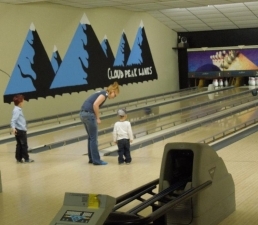 Our Featured Member for February is Cloud Peak Lanes, a busy recreation center in our community that has been a part of the Chamber for over 24 years … and a part of the community even longer. The place was bustling when we dropped by last Saturday afternoon. Some 130 kids had been there in the morning, for the usual Saturday morning youth bowling league. Then, in the afternoon, almost all of the 20 lanes were filled with men competing in the Men’s City Tournament happening that day. But down at the end, in the first three lanes, there were kids having a birthday party with their own brand of bowling fun. As co-owner Mike Hardesty pointed out, bowling is a sport for all ages. From the preschoolers, who push the bowl to roll down the lane (with the bumper guards raised on the sides of the lane) … to the handful of “regulars” who are still playing every week at age 90-plus. Hundreds of Sheridan County residents are bowling at Cloud Peak Lanes every week – most of them on teams in the youth league or one of the seven men’s, women’s, mixed, or senior leagues. Seven days a week. There are usually 3-5 children’s birthday parties every weekend too, and lanes set aside for open bowling for individuals or small groups who just drop in to play. 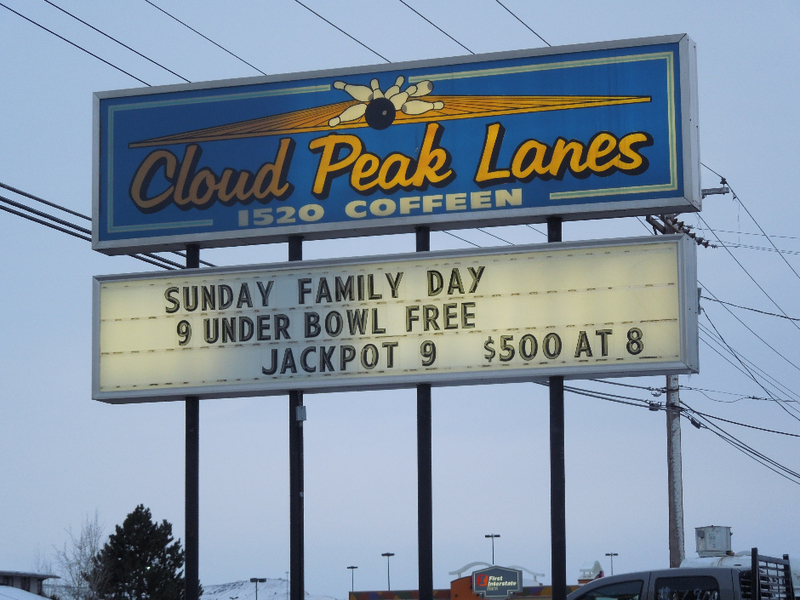 Over the next two weeks we’ll be covering the history, ownership, and special events at Cloud Peak Lanes. In the meantime, how long has it been since you’ve gone bowling? ?It’s great physical exercise, a great family activity, and a great idea for a date … and it’s FUN. You can even still join a league that might have some mid-year openings. You know where they’re located – set back from the street at 1520 Coffeen Ave. The phone number is 672-7459. Check out the website too – www.cloudpeaklanes.com. 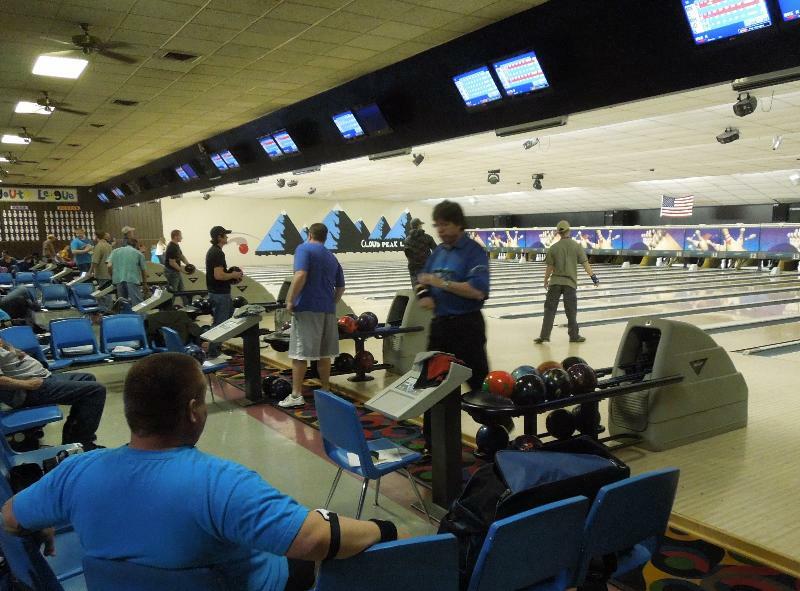 Last week we provided a glimpse of the activity level happening at the bowling alley. This week we’ll step back and take a look at its history in the Sheridan County community. Cloud Peak Lanes, with 12 bowling lanes, was built at its current location in 1958 or 1959, by Wes Christianson and Olive Davenport, farmers out of the Dakotas. At the time, and for years after, Cloud Peak Lanes (and for a while another bowling alley, Sheridan Recreation, behind what is now Bank of the West), the drive-in movie theater, the roller skating rink, and the YMCA were the recreation hubs of Sheridan, especially for the kids. After several years, Wes and Olive sold the bowling alley to Scott Lockens, who later turned the business over to his daughter and son-in-law, Linda and Attila (“Bert”) Bertalan, who operated it for many years. It was in the 1960s that Bert expanded the building and added eight more lanes, to the current 20 lanes today. Then Bert died in January 2007 and Linda either needed to find a new owner or close the business. That’s when the Hardesty brothers appeared. Jim and Mike Hardesty had grown up in the Sheridan area, at the family ranch in the Wyarno area where Jim still lives. Jim and wife Candy and Mike and wife Kyla wanted to keep bowling alive in Sheridan and purchased Cloud Peak Lanes in Summer 2007 .. and continue to operate it today. Next week we’ll be looking at some of the special events at Cloud Peak Lanes, and especially the events that bring bowlers to Sheridan from all over the state of Wyoming. We also give special acknowledgement to Dr. Oscar Rojo of Sheridan, who provided much of this history. Oscar was bowling at Cloud Peak Lanes when it first opened in the late 1950s and is still, in his 90s, bowling there two to three times a week. He must like it. Today we’ll look at some of the special events happening at the bowling alley. First and foremost are the bowling leagues, which start in late August (when the bowling alley re-opens after a summer hiatus) and continue until May. There are seven adult leagues, as well as a youth league with kids ranging from age 4 to age 18 who play on Saturday mornings. There’s also a traveling youth group (about 32 youth) who compete with a traveling youth team in Gillette – one month they play in Gillette, the next month they play in Sheridan. Want to join a league mid-year? Give them a call – there are occasional openings. Last year Cloud Peak Lanes hosted the Women’s State Competition, with 170 4-person teams playing in Sheridan over four weekends. The year before, the Men’s State Competition was here, and Sheridan will have Men’s State again this year – 200 4-person teams – coming and going for five weekends in late April and early May! 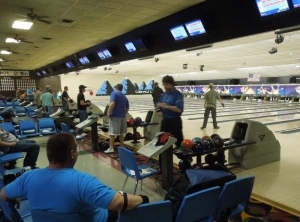 Then June will bring the Wyoming Bowling Proprietors Association “High 5” tournament, where bowling alley owners in Wyoming send their 5 men and 5 women bowlers with the highest averages to the statewide “high 5” tournament here in Sheridan. Last fall Cloud Peak Lanes hosted a special event on behalf of the Wounded Warrior program, with NFL Quarterback Jim McMahon as a special guest; they’re hoping to get him here again sometime soon. And there are more events happening on a regular basis. Certainly birthday parties (with several choices of party packages). Jackpot Bowling every other Saturday, with colored pins and a jackpot prize. Every Sunday, 12 noon to close, is Family Fun Day, where kids age 9 and under are free! Then while you’re there, there are plenty of food choices, a full bar, video game area, and a pro shop. Drop by and renew your love of bowling! 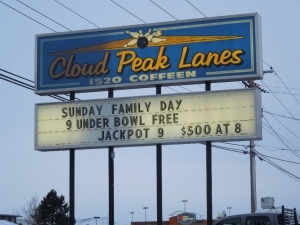 Find Cloud Peak Lanes at 1520 Coffeen Ave., (307) 672-7459, www.cloudpeaklanes.com.